Olive Branch IT Services and Computer Tech Support Serving Melbourne, Palm Bay, Cocoa Beach and Brevard County in Florida. The backbone of any corporation or business, large or small, is the information technology it relies on every day to make its business run. Information technology is our only business and we are experts in the field of IT engineering and providing technical support to our clients. We will understand exactly how the IT equipment you use is set up, how it functions to help your employees do their job, and how it helps you to conduct your day to day business. We will know if it is the most efficient system for you and how and where it can be improved to make your business run more effectively. of downtime, can be very costly to any business. This is especially true over an extended period of time and even more so if you are a large corporation. Our goal at Olive Branch is to make sure you have the proper hardware, technology and techniques in place to ensure minimal down time when there is a system failure of any kind. Our job as your IT provider is also to increase your productivity with the right hardware, keep you up and running, keep your system secure and plan for your future growth! Existing technology becomes obsolete very quickly today, as advances in the speed and capabilities of new hardware are coming out faster than ever before. So fast in fact, it's almost true that your hardware is obsolete by the time you have it set up and running. The same advances that you see happening so quickly with cellphones and now tablet PCs are also happening on the corporate IT level. The hardware is changing on an almost daily basis. Network Design and Implementation - As we said earlier, a fast and efficient network is the backbone of any business or corporation. Whether it be for five people or five hundred people, Olive Branch IT can work with you to design and implement the networking solutions that are right for your company. We will design, install and maintain the newest, fastest, most secure and cost-effective IT system for your business or corporation. Afterwards, we will maintain your network and provide complete technical support to all users of the network. Olive Branch IT is a leader in network design and implementation in Melbourne, Palm Bay, Cocoa Beach and Brevard County in Florida. Besides transferring data and facilitating transactions, the one thing almost every business or corporation relies on, more times a day than anything else, is email. But yet, most email systems are set up on a remote server hosted somewhere off site, with no way for us to be able to do anything for you if something goes wrong. There is nothing we can do if someone else's mail server goes down or if email somehow gets deleted and it has already been deleted from a remote mail server. We can set you up with you own mail server on site, with on site and off site backups of all your email that are automatically archived and kept for as long as you want them. This way if anything happens, we can restore your email for you in literally just minutes. We'll even set up every one of your employees' cellphones to make sure they can access their email on their cellphones while out of the office. The worst thing that can happen to any business or corporation is a network crash or data loss. If your network goes down or you have data loss due to a system crash or an accidental file deletion, do you have a backup plan or a backup? Is your business prepared for the worst? Having a backup strategy and a data backup and recovery system is crucial for the survival of any business. When it comes to data backup and recovery, we are the experts. 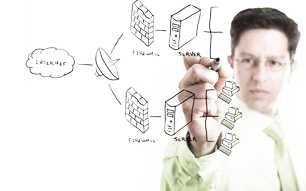 We will work with you to design and implement a Data Backup and Disaster Recovery Plan. We will make sure your data, including all your email, is backed up and secure. We will protect the important data that is essential for your business from threats such as viruses, accidental deletion, natural disasters and more. With off site data backup, you are safe even in the event of a fire, flood or hurricane. We have your data safe and secure and can have you back up and running as soon as you can access a computer system or reoccupy your building. Of course there is never a good time for your computer to crash, but we've seen time and time again how it always seems to happen at the worst possible time! When your computer crashes, Olive Branch IT offers fast and friendly service to get you back up and running again. When it comes to software support, hardware support or even just answering questions about how something works, Olive Branch IT can help with computer technical support in Melbourne, Palm Bay, Cocoa Beach and Brevard County in Florida. Contact us today so we can give you an evaluation of your current network and see where we can help upgrade or improve the performance and security of your existing network, or design a complete, secure network for your business! For more information about Olive Branch IT's services, click here, or to get in touch with us visit our Contact Page. One of the biggest threats to IT systems and networks today is security. Hackers are a constant threat to any corporation or business that conducts financial transactions of any kind or stores personal data of any kind on their clients or customers. It is vital for your network to be rock-solid secure from any kind of attack. We can help you make sure your system will not be compromised and have important financial and personal data stolen. Viruses are also a constant threat, so we always make sure your network is running the latest in spy-ware and mail-ware protection, which is constantly updated as new threats are identified. sick and tired of BAD technical support? solutions are just one single click away!